You guys. This dinner was EPIC. I am not even exaggerating, I think this may have been one of the best meals I have ever made at home. I’m not even kidding. I combined several different recipes (this one from the Clever Carrot was probably the most influential) to make this one that suited our family’s needs – it was easy and seriously so delicious. So first you have to marinate the chicken. Cube up the chicken breasts and toss them in a bowl with the evoo and some salt and pepper. I use this awesome basil-inflused olive oil I get at a local store – if you have access to anything like that, try it! Otherwise regular evoo works great. 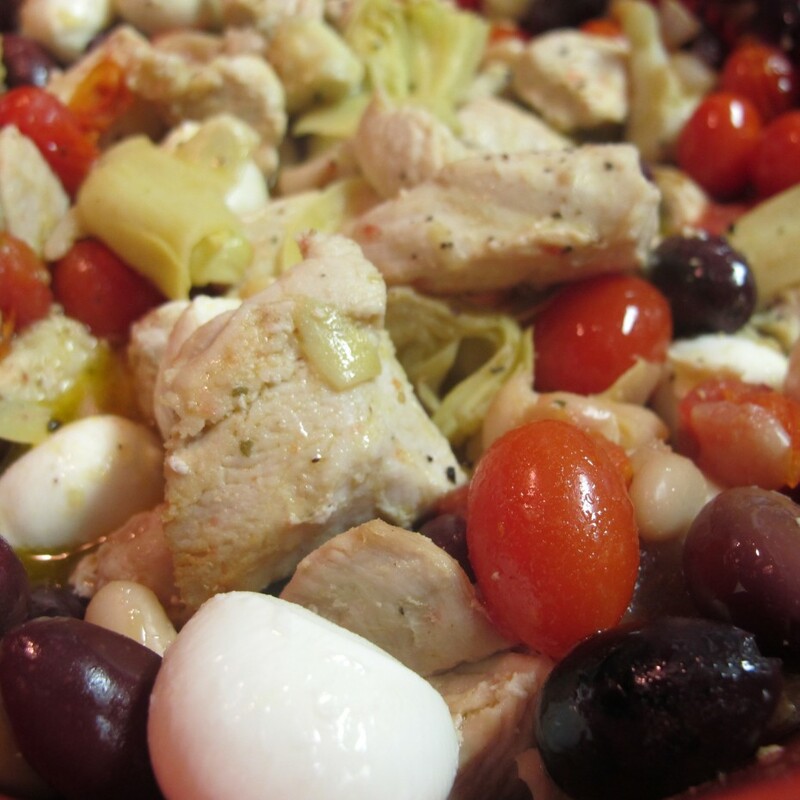 Also important – drain your artichokes but save the juices they are in to add to the marinate. Be sure to toss it all well and leave it in the fridge for an hour or more to let it all soak in. Later, cook up the chicken in a big skillet or pan. 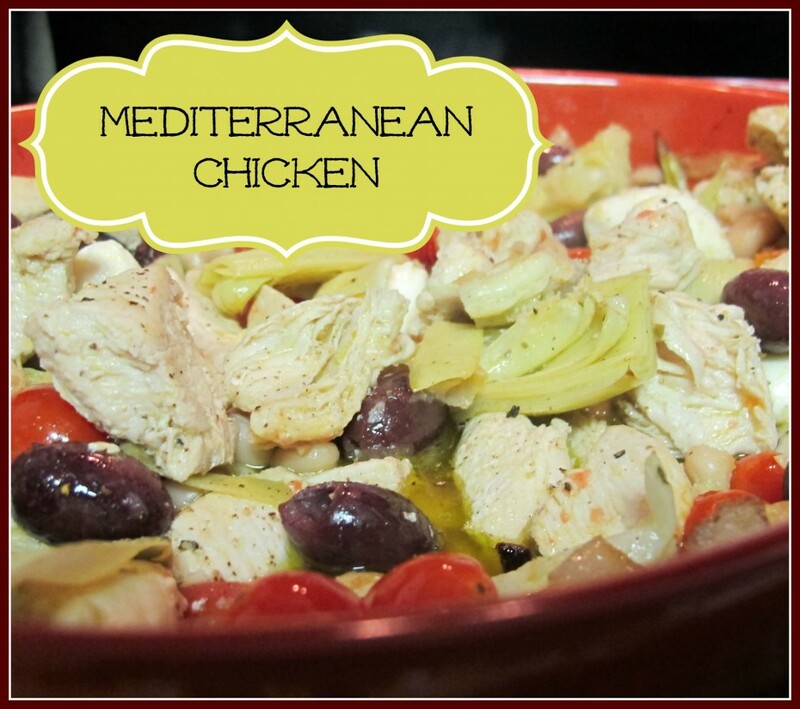 I used all of the juices it was marinating in to cook it in – kept it nice and juicy! You only have to cook it about 10 minutes – it cooks up fast and don’t be concerned if it’s not 100% cooked because it’s going in the oven soon. Cut up the red onion. While your chicken is cooking, preheat your oven to 400 degrees and in a big baking dish toss the tomatoes and red onion into the dish and toss with some olive oil and fresh ground pepper. Cook for about 10 minutes at 400. 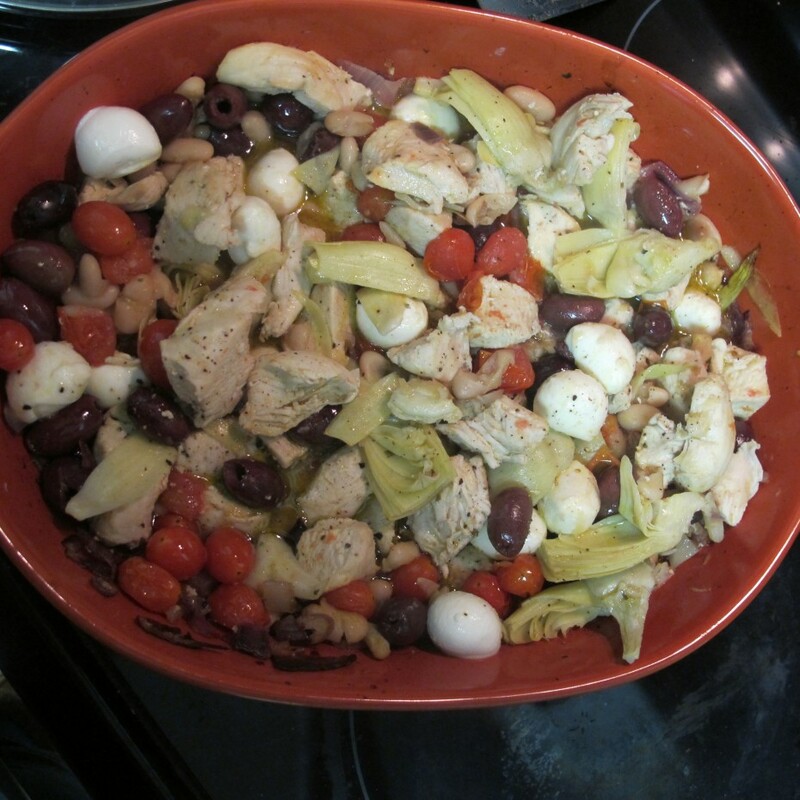 Once the chicken is done and the tomatoes/onions have been in for 10 minutes, take the baking dish out and toss everything except the mozzarella balls together – add in the artichokes, kalamata onions, chicken (with the sauce it cooked in – yum!) and beans. Add in some fresh ground pepper and salt if you want! Put it back in the oven for another 5-10 minutes depending on how cooked your chicken is. Once that’s done, pull it out and add in the fresh mozzarella balls. They will melt because the food is hot so you may even want to wait a couple of minutes before you put them in. I did it right away and they melted flat – I think waiting just 5 minutes would have made them soft but not totally melted. Either way – so delicious. I seriously can’t tell you guys how good this was and I know it looks like I typed a lot but I’m verbose – it was really simple and didn’t take me more than 30 minutes to do everything! Enjoy! Sounds wonderful…did your artichokes have garlic in the juice? If so, I would probably make my own marinade. Will definitely try this one!!!! !